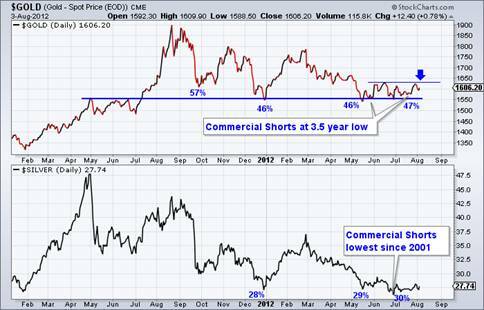 Back in April we were a bit presumptuous, believing the gold stocks would soon bottom. The ongoing correction was a water torture decline that avoided capitulation. Finally, in the middle of May we were confident that a major bottom was at hand. We argued that the market would make a higher low in July or August. 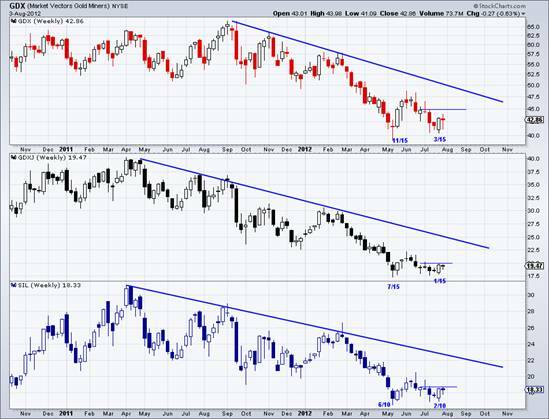 Well, the market bottomed that week and the shares are now on the cusp of a potential double bottom. Some bottoms occur instantly while some take a few months to develop. We believe that Gold and the gold stocks are primed to head higher in the coming weeks and if true, it will further confirm the May bottom. Below we graph GDX, GDXJ and SIL. First we want to note that each market has failed to make new lows despite recent negative news for the sector. First, the big three (Barrick, Gold Corp and Newmont) all had major earnings disappointments. Second, neither the Fed nor the ECB did or said anything new (regarding policy). When a market fails to go lower on bad news it is potentially a very bullish signal. In the weekly charts we see that each market has navigated a potential double bottom that could be confirmed with strength over the next week or two. The fractions show the number of stocks within those indices which made new lows. As you can see, far fewer stocks made new lows during the second bottom. This reflects stronger breadth and is another bullish signal. As my friend Tiho says, Gold is the most important market because it’s the granddaddy of the precious metals complex. Below we graph both Gold and Silver using their daily closing prices. We also added the public opinion readings (c/o sentimentrader.com) as well as an annotation regarding the COT. In regards to price, Gold has essentially not made a new low since the very end of December. It tried five times with the last in June. The market has inched higher and a close above $1625 could confirm the bottom. Note how sentiment in both markets has not improved despite no new lows in either market (though Silver closed at a new low but then quickly reversed). 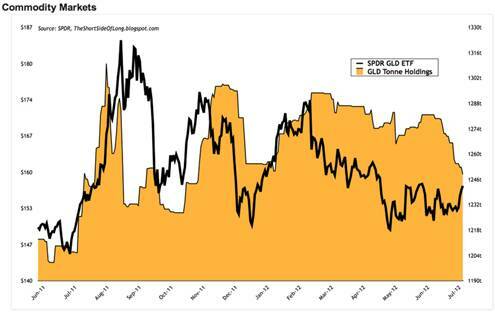 Furthermore, consider this chart from Tiho which plots the Gold price and the holdings in GLD. The holdings are currently at 1250 tonnes. In June the retail crowd began moving out of Gold yet the Gold price began to inch higher. If retail holders are bailing out of GLD yet Gold is going higher, then who was buying in the last month? The bottom line is this sector is very close to a breakout which would likely confirm the May bottom. The price action has started to improve and the sector has not been deterred by the aforementioned bad news which, in normal conditions would have caused a selloff. In the meantime, the public has been bearish the entire year and the dumb money has started to exit the market. It is this combination of factors that lead us to a firm bullish posture over the rest of the summer. If we are wrong? Well, at worst these markets could tread water.